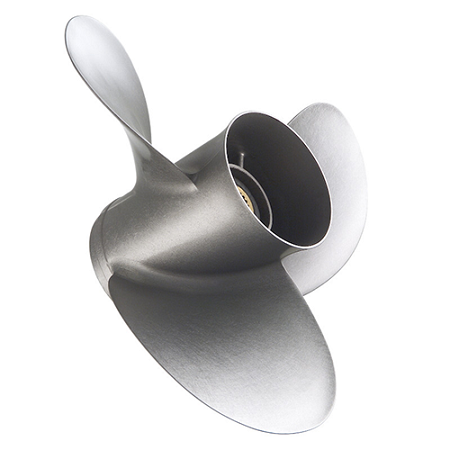 The propeller features a rubber bushing on a bronze splined hub. The rubber bushing helps absorb vibration, engine shift shock and impact from submerged objects to protect your engine's prop shaft, drive shaft and power train. The broad diameter and incredible amounts of blade area deliver maximum thrust for larger, heavier boats. Large blade area for increased efficiency. Greater thrust at all RPM ranges delivers greater maneuverability at all speeds. The brushed satin finish provides pleasing aesthetics and corrosion resistance.